This past Friday, my daughter noticed something downright bizarre written on the package of Osem chocolate-chip cookies in our cabinet. At first I didn’t get it. How could this possibly be a description of Friday afternoon at anybody’s house? But then I understood. This is what 2:25 PM on Friday afternoon might look like at the home of a person who doesn’t keep Shabbat. Sounded tempting. But what an awful deal!! No matter how yummy chocolate-chip cookies and hot chocolate in bed taste, are they worth a life without the blessing, the tranquility, the family-time that is Shabbat? The challenges of maintaining a home. The challenges of living a Jewish life. not that i suggest that we should be oppressed (lo aleinu), but that we should recognize how delicate our situation is and always work to strengthen our connection to Hashem. THANK YOU for writing these thoughts about cookies as a highlight of “the week-end.” Isn’t that sad!? Shabbat is truly the sweetest gift. Shabbat is between Hashem and the Jewish people. 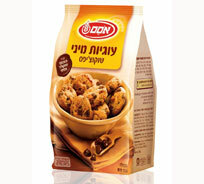 The menucha and simcha of Shabbat can in no way compare to a cookie — even the best cookie a factory can produce. Ah, Shabbat… isn’t it heavenly!? Hmmmmm. Mixed feelings here!!!! I was brought up in a very traditional home with all the fun and family and ritual of shabbat (and yamim tovim), minus the stress and denial. Shabbat was happy, the food was fresh and crispy out of the oven, there was the chassidic song festival collection blaring on the stereo in the background with all of us harmonising…… zemirot……birkat hamazon….. shul….. I made aliyah because of those strong feelings of happiness, attachment and commitment that my parents instilled in me regarding my Judaism. Because of aliyah, it led to the path that led me to become observant – and have double the number of children than I had planned on having!!!!. Now, shabbat is not what it was. Neither is Yom Tov. There’s no Sunday to fall back on, and it’s all about stress and deprivation for me! I WISH WISH WISH that I could say that I love Shabbat, that it’s peaceful, that I enjoy the time with the family……. but its a challenge that deeply saddens me. After all these changes I’ve made……. Now, I’m not trading it for a chocolate chip cookie (funny, there is an article in mishpacha about what value we put on our mitzvot) and I am saddened when I see my family back home completely disregarding shabbat and know that it’s how I was. However I know that I’m not giving my kids what my parents gave me. A HAPPY jewish experience. It’s a real struggle for me. Maybe when the kids are bigger I will enjoy it more. Here’s hoping!!! hang in there, YL! shabbos was fun for me, too, when i was growing up non-observant. totally stress-free. then shabbos became a burden. but after asking many more experienced moms what will help, i learned how important it is to SIMPLIFY our expectations of OURSELVES. once i simplified my shabbos preparations, and learned to accept different standards of menus/meals/clean home/guests/etc.. i started to fall in love with shabbos all over again. over time, i was able to change my standards/raise my expectations one thing at a time without getting stressed. i was surprised that my DH was supportive of this change, as i had thought i was making things so complicated for his sake. but it turned out that he preferred a relaxed and happy wife/mother to a “perfect” shabbos. as in many things in our lives, we are more often stressed by our own inappropriate expectations than by the “reality” of our lives. make reachable goals and take baby steps, and eventually we will all see improvement in seemingly impossible situations. thank you tamar for caring enough to write these words of encouragement and advice. The biggie here is to remember to lower my expectations…… and if I’m doing something right, you can bet there’s a treat for mummy hiding at the back of the fridge every shabbos! I was disappointed in your assumption that the only house these chocolate chip cookies could represent was one where Shabbat was not observed. We have always organized Shabbat by a Thursday night so we can enjoy a Friday instead of being frantic. It is disappointing that you think of no other situation for an observant family to be ready in time other than your own experiences. I admit it is easier to be ready earlier without small children but it is doable if it is important to you. I can regularly host a relaxing coffee and cake time with out guests or family who come to visit at this time and ensure Shabbat is ready.